Posted on September 8, 2014 in VS. In this weeks BIG Fight we have two extremely similar fighters, both are rogues, flirts, scoundrels but always do good in the end. In spite of this both have a tendency to end up as wanted men, often only a step or two ahead of Bounty hunters. Where as one debuted in 1976, the other debuted a year later in 1977. Indeed the similarities are most uncanny however one is perhaps the most iconic characters in all of fiction where as the other has only been popular in the past 6 years if not less. If the title didn’t give it away I am of course talking about Han Solo and Star-Lord. To decide each fight’s winner we will simply count your votes and announce it before the following week’s fight, Since many continuities can exist from each character — we will give you a definitive list of each fighters attributes drawn from multiple story lines. In this first week’s fight: Standing in the Dark Horse corner, hailing from Correlia is: “Captain” Han Solo. Solo in Dark Horse’s recent Rebel Heist series. Originally a roguish scoundrel who traveled through the galaxy smuggling goods for criminal organisations like The Hutt clan, Han proved himself a hero on multiple occasions by piloting the Millennium Falcon into battle — thus saving the Rebel Alliance from the original Deathstar at a crucial point in the battle, following this he sacrificed himself as he was frozen in Carbonite (and taken to Jabba, who had placed a bounty on his head) and following a breakout from Princess Leia, Lando, Luke, Chewie, R2 and Threepio from Jabba’s palace — he accompanies Leia and Luke to the forest moon of Endor where he helped to lead the natives into battle against the Empire, which was finally brought down after decades of power within the galaxy. Following the fall of the Empire, Both Han and Princess Leia had children who became Jedi, it is around this time it is noted that Han Solo is “Force-attuned” — which means that he has a higher sensitivity to the force than non-Jedi but not enough to be force sensitive, how this vaguely defined term would manifest itself is anyone’s guess but it isn’t a stretch to imagine that could be why Han is quick off the draw. Han’s most powerful weapons are his Blaster — which is the preferred choice of pirates as it can pierce Stomrtrooper armor. However Han’s most powerful piece of equipment is the heavily armored and modified “Millennium Falcon” which is outfitted with a Hyperdrive — this has been argued ad nauseum as being faster than a Warp Drive, the Falcon can jam sensors allowing it to block enemy communications and ensure a level of stealth flight and lastly the Falcon is equipped with multiple lasercannons. Physical attributes: Corellian Space Pirate. Skills / Equipment: Ruthlessness, Expert Marksman, Slight of hand, multi-lingual, extremely skilled pilot, “force-attuned”. Owns a DL-44 heavy blaster pistol [armor piercing] and the Millennium Falcon — .modified AG-2G quad laser cannons, sensor Jammers and a Hyperdrive (faster than warp). Weaknesses: Han Solo has no true powers per se which means he can be killed by conventional weapons… if anyone can shoot him first. Power Level: 3/10 – Han Solo appears to be physically fit as a a typical human being, though he also appears resistant to freezing (having survived Carbonite Hibernation and the temperatures of Hoth and He also has a low level affinity for the Force. Han is extremely skilled in strategy, weaponry and technology. In the Marvel corner, Hailing from Earth , we have… Peter “Star-Lord” Quill. Star-Lord aka Peter Quill debuted in an 1976 issue of Marvel Preview written by Steve Englehart. and later written by Chris Claremont, this version of the character was an orphan whose Mother was murdered by Aliens, following this he joins NASA as an astronaut in his adult life but his reckless behavior does not bode well. When a cosmic being named the “Master of the Sun” arrives at a NASA space station the Astronaut steals a scout ship and goes to meet the being who proclaims him as “Star-Lord” and equips him with a sentient ship named “Ship”. The character received several recent retcons towards his back story following the relaunch of Guardians of the Galaxy in volume 3, these retcons elaborated further on the character being the son of J’son of Spartax, an Alien prince who left Earth to ensure his child and lover would both remain safe leaving behind his element gun. The aliens who murdered his mother were now the perennial Guardians of the Galaxy antagonists “The Badoon“. At a later point in the characters history, he ends up imprisoned in the Intergalactic prison the Kyln, however during the events of Annihilation War is freed by Nova aka Richard Rider, he then works for the Kree Empire until it is attacked by the Phalanx thus directly bringing about the events which lead to the formation of the Guardian’s of the Galaxy. 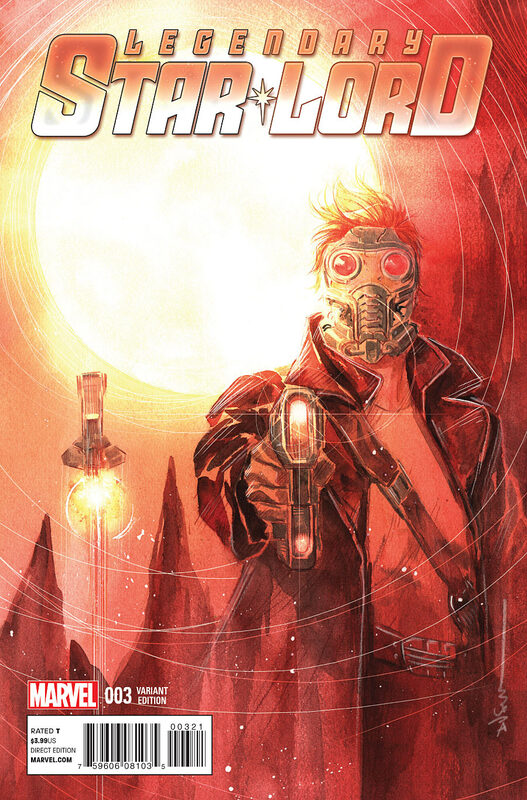 The success of the Guardians of the Galaxy has seen Star-Lord receive his own title, in the most recent issue of which he acquires a new space ship, which is again seemingly controlled by a sentient AI, this ship is named “Bad Boy”. Facts: Quill recently traded in a outer space battle suit for one that is more like his movie interpretation, In addition he also now uses Quad Blasters as his trademark “Element gun” was destroyed. This would appear to be somewhat of a downgrade in his personal arsenal. Physical attributes: Human / Spartoi hybrid astronaut. Powers/Skills/Equipment: Expert Marksman, sleight of hand, skilled pilot, peak physical and mental conditioning and longevity due to Spartoi genetic traits. Carries quad blasters, a battle helmet that can translate multiple languages, allow for oxygen in deep space and improves sight. Lastly, Peter pilots the sentient ship the “Bad Boy” — Which comes with Titan Blasters and a Warp Drive. Weaknesses: Has a tendency to have bounties placed on his head from deals gone bad to just being flirtatious. Power Level: 4/10 – Star-Lord is the peak of possible fitness due to his hybrid physiology, this is on top of having a basic skill set similar to Han Solo. Thought the edge in terms of power goes to Quill since his genetics grant him abilities beyond that of a human. Lets get it on, **DING, DING**. In the last BIG Fight we pitted clone against clone, as the Thunder God — Thor’s duplicate took on Superman’s Bizarro clone, and with 66 % of the Votes: Bizarro won the fight.